Prologo Saddles :: Best Prices on the Web! As bike fitters we’re always aiming to stock the best possible products when it comes to the all important rider contact points and there’s no contact point more important than the saddle. We’ve selected the best of the best from Italian saddle supremo’s Prologo. Whether you’re after a top level perch for your road/mtb or tt bike we’ve got the saddle to suit you at the BEST PRICES ON THE WEB. Our introductory offer prices won’t be beaten. 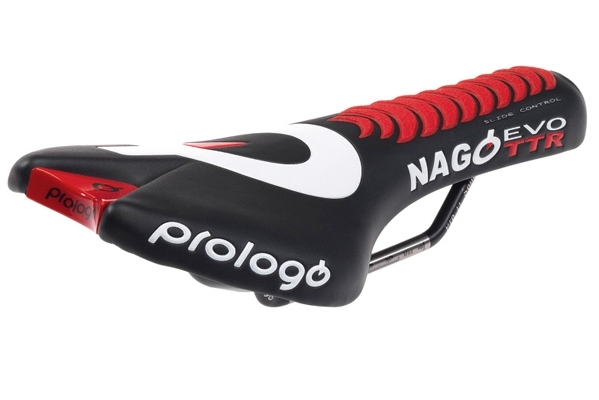 The Prologo Nago Evo TTR is the first saddle on the market to introduce revolutionary new “Slide Control” technology. With a fatter, shorter nose than a standard road saddle this saddle is the perfect perch for any high performance time trial or triathlon machine. Developed in conjunction with World Time Trial Champ Fabian Cancellara. The Prologo Scratch is the most popular saddle in the Pro Peleton. Designed for all day comfort without sacrificing performance. Available with either Ti Solid or “Nack” carbon rails. Active density padding relieves frontal saddle pain. This entry was posted on Monday, September 13th, 2010 at 3:40 pm	and is filed under All Posts, Bike Fitting, Products. You can follow any responses to this entry through the RSS 2.0 feed. Both comments and pings are currently closed.